Looking for a way to liven up your breakfast routine? Take some of the best-tasting, nutrient-packed, healthy topper to boost your breakfast into something amazing. Bursting with nutrients and surprisingly tasty! 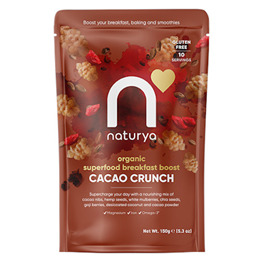 Naturya`s Cacao Crunch is exactly what all of you chocolate lovers have been after. Loaded with cacao, hemp, mulberries, chia and goji this boost will add a bunch of chocolatey goodness to just about anything you can think of sprinkling it over. Start your day in an incredible way. Naturya products are born from the wonder of nature, not the processes of food technology. All are easy to consume and form part of a wider, virtuous circle that values simplicity as a pathway to health and longevity. Add it to porridge, yogurt, smoothie bowls, add it to a bowl of fruit or you can even nibble it as is. 1 tablespoon (15g) is enough to boost your breakfast. This product is packaged in a factory where nuts, peanuts, dairy, soya, sesame and sulphites are also handled. 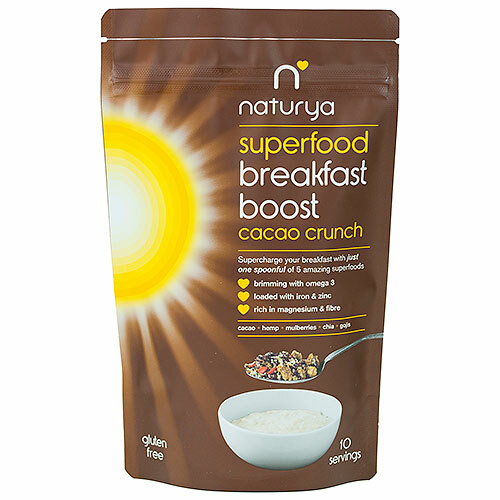 Below are reviews of Naturya Breakfast Boost Cacao Crunch - 150g by bodykind customers. If you have tried this product we'd love to hear what you think so please leave a review.